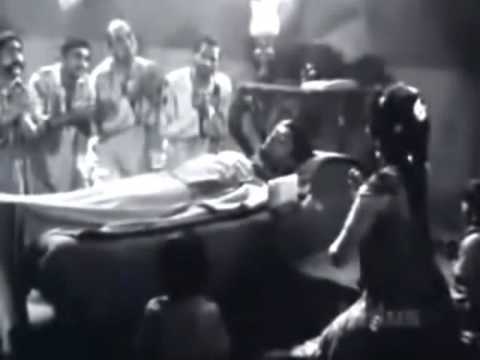 Do Aankhen Barah Haath (English: Two Eyes & Twelve Hands,Hindi - दो आँखें बारह हाथ )is a 1957 Hindi film directed by the Indian film director V.Shantaram, who also starred in the film. It is considered one of the classics of Hindi cinema and is based on morals of Gandhian philosophy. It won a Silver Bear at the Berlin International Film Festival and it was the first Indian film to win a Golden Globe Award. The film is also remembered for its theme song, Aye maalik tere bande hum, sung by Lata Mangeshkar and written by Bharat Vyas. The film was inspired by the story of an 'open-prison' experiment in the princely state of Oundh near Pune, which was recounted by screenwriter G. D. Madgulkar to V. Shantaram. In 2005, Indiatimes Movies ranked the movie amongst the Top 25 Must See Bollywood Films. During the filming V. Shantaram battled with a bull and he hurt his one eye during the stunt, though luckily his eyesight survived.The film was later remade into the Telugu color film Maa Daivam (1976) starring NTR and Jayachitra. The Hollywood film The Dirty Dozen (1967) also appears to have been inspired by this film. The film portrays a young jail warden, Adinath9V.Shantaram), who rehabilitates six deadly prisoners released on parole into persons of virtue. He takes these six notorious, surly murderers and makes them work hard with him on a dilapidated country farm and produces great harvest. He wants to rehabilitate them through hard work and kindly guidance. The film ends with the death of the warden at the hands of his enemies, and manifests how reformed his pupils after all his work with them.